My mother always raised me to help others, not because we have a lot, but because we know what it’s like to have nothing. I am the child of two undocumented immigrants who brought me here when I was just one year old. My parents had businesses here when I was young, but when the market crashed in 2008, their businesses fell apart, along with their marriage. From then on, my mother and I clung to one another and worked as hard as we could to make a good life for ourselves. When I was 15, I started working at flea markets and bars while attending high school. In high school, I was Student Council Treasurer, and part of Texas Association for Future Educators, National Honor Society, and Skills USA. When I graduated high school, I was not able to get the funds that I needed for further schooling, but a generous individual payed for my first year of community college. After that year, I was working and attending school full time. My mother and I were able to afford community college and I graduated with an associate’s degree and a 3.8 GPA. I then applied to the University of Houston and TheDream.US scholarship, and fortunately, I was accepted into the program. I am currently studying construction management and would love to help undocumented families by either setting up a foundation to help them make ends meet or building homes or apartments that are easily attainable to those who are undocumented. In addition, I would like to have a foundation that helps families with sick children. I believe that children should be given all the help they need in order to experience a long and healthy life. 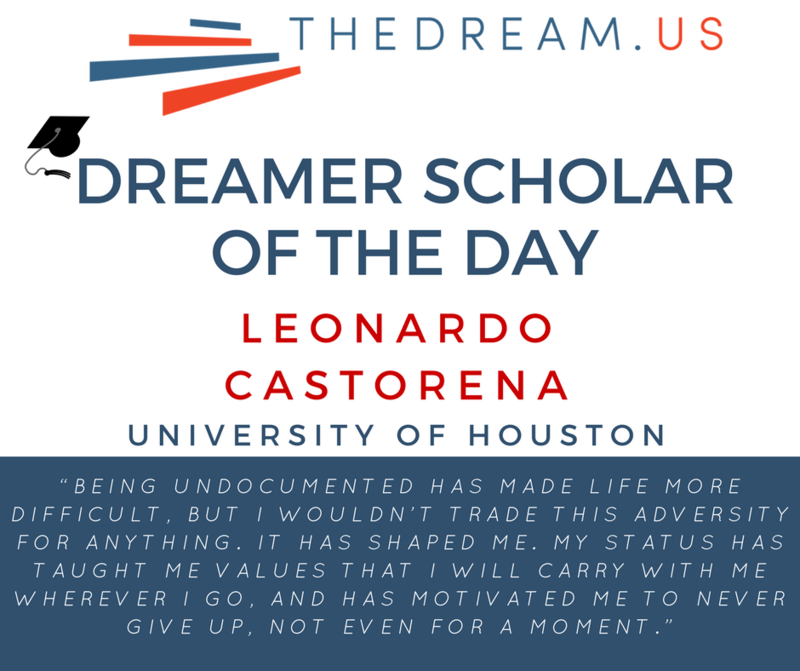 DACA has allowed me to come out of the shadows and to achieve my full potential. Without it, I do not know what would happen to me, and quite frankly, do not want to know. I want to inspire those who think it is impossible to become something when the world appears to be against you. All DREAMers have the capacity to be great, we just need an opportunity to fulfill our dreams and potential. I would like other DREAMers to know that there is always a solution; where there’s a will, there’s a way. Being undocumented has made life more difficult, but I wouldn’t trade this adversity for anything. It has shaped me. My status has taught me values that I will carry with me wherever I go, and has motivated me to never give up, not even for a moment.